I sit on a cool bench inside an underground stone hollow that was probably used as a water cistern in first-century Jerusalem. Our group walks down a staircase to join me after they poke their heads into an ancient, empty tomb. It’s a tomb that resembles the one which once held the body of Christ. We’re in a beautiful area known as the Garden Tomb complex, just outside the old city. In 1883, a man named Charles George Gordon noticed a cliff face just outside the city walls that, from some angles, resembled a skull. Since the Bible says Jesus was crucified at the “Place of the Skull,” his interest was piqued. Like many visitors to the old city, Gordon found it hard to relate to the stuffy Church of the Holy Sepulcher. After centuries of reconstruction, it just didn’t look like a garden anymore. Gordon thought the area he discovered looked more like the place Jesus was crucified than the traditional site. When he learned several ancient tombs had also been found nearby, Gordon became convinced one of them must have been the tomb of Jesus. While most biblical archaeologists still favor the Church of Holy Sepulcher as the more likely historical location for the biblical events, the Garden Tomb is nevertheless a great pilgrimage site. It’s much easier here to imagine the scene of the resurrection as described in the Bible, easy to picture Peter and John running to this tomb. The Gospel of John describes their footrace. It’s as if John decided, when he began writing his gospel, to remain humble and refer to himself simply as “the other disciple” — but at a few points he still wants to give himself a shout-out! John says that although Peter lost the race to the tomb, he actually went in first — and something in particular caught his eye: The cloth that had been wrapped around Jesus’ head was folded up neatly, while the other grave clothes were still in their place. In other words: This is not what a grave robber would do. Or could do. Peter was working the scene out in his mind like a forensic detective: Either the body would have been stolen with the grave clothes still on it, or, if they were desecrating the body, they might have removed the grave clothes — but then the funeral linens would have looked like unspooled toilet paper, littered across the floor of the sepulcher. But this? It’s almost as if the body had just faded right through the cloth without disturbing it — and then the head covering was neatly folded up. There are three different words used for “see” in this passage. Then in verse 6, when Peter goes in and sees the strips of linen, it’s a different word, the one from which we get our English word “theorize.” He was trying to come up with a theory to explain the weird things he was seeing. Finally in verse 8, when the other disciple goes in and believes, the word used there means “to perceive, to understand, to intelligently comprehend the truth.” He got it. There was only one possible explanation. Peter saw the same stuff as the second disciple. The physical things. The evidence. But he just looked and theorized. Maybe he just couldn’t believe what his eyes were telling him. The other disciple saw — and believed. Someone said he had Easter eyes. 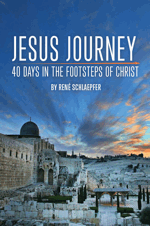 I read this story to our group and I ask them ,“So after all our days here in the Holy Land do you see? Or do you see and believe? Then we take communion right there in this ancient garden. Why didn’t Peter see and believe right away? For one thing, I suspect he was hampered by guilt. And fear. If what he was seeing meant that Jesus was alive again, then he, Peter, surely felt he was in big trouble. He had denied Christ in his hour of need! And Jesus is about to take care of that shame on the shores of Galilee. How do you see it? Have you been merely glancing at the evidence? Have you stalled out at “making theories”? Or do you choose to see and believe?